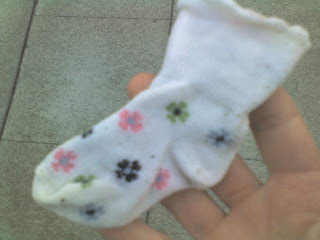 While walking to the bus this morning I looked down to see this tiny, cold, wet and shivering sock. Just a single sock, separated from his twin. Then it struck me...it's Addie's sock. It must have jumped overboard on their walk yesterday. I picked up the limp and scared sock and warmed him in my hands. Boy, was he happy to see me. I'm certain it will be a tearful reunion this evening.